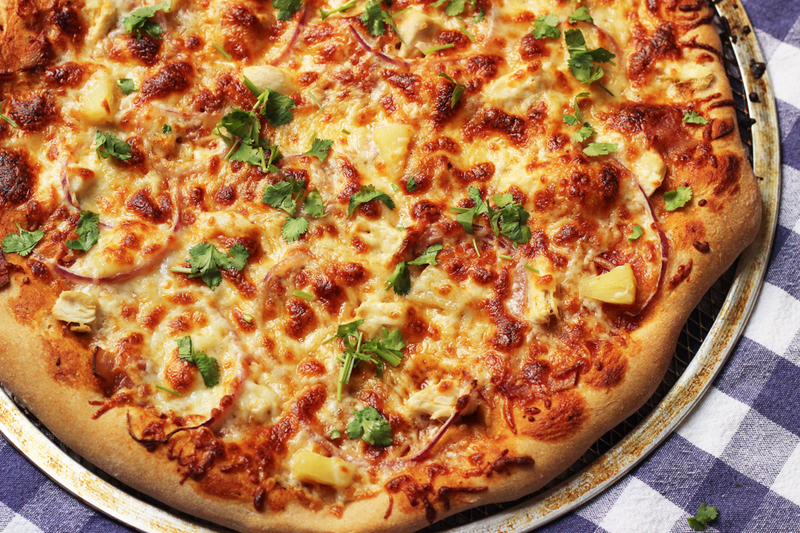 Make Pizza Night out of this world this week with a BBQ Chicken Pizza with Bacon & Pineapple – so simple, good, and packed with flavor. Just be sure to make more than one. Pizza Night is a big deal at our house. If I don’t make pizza on Friday night, or at the very least Saturday night, you might expect a mutiny around here. Or at least extreme shock. Or much pushback. Pizza Night is a near and dear weekend tradition in these here parts. When the kids were little, I made lots of personal pizzas so each kid could decorate it however he wanted. Nowadays it’s usually only the girls (10 and 8) who are concerned with decorating. Most of the time, I make 5 medium-ish pizzas and 2 small ones. Sometimes pepperoni plays a starring role. Sometimes with some mushrooms and black olives thrown in for good measure. But, sometimes…. 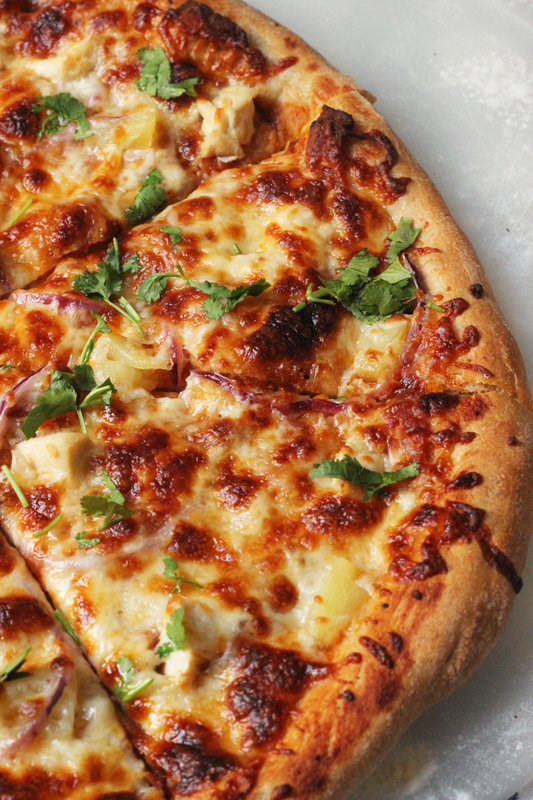 I have fun with the toppings, such as in this BBQ Chicken Pizza with bacon and pineapple. So very much yum here, I’m not even sure what to say. So good. This pizza was inhaled in a matter of seconds. The teen boys declared it a hit. I got one piece. My husband got none because he shuns pineapple on pizza. He should really rethink that rule, especially when uber-spicy BBQ sauce and bacon are involved. But, after 23 years of marriage I’m not going to win that battle. No problem — more for me! So long as I make two or three pizzas like this next time! Normally, I make my own BBQ sauce, but on a Friday night when I’d enjoyed a full afternoon off-duty, I wasn’t in the mood for saucing. Instead, I made good use of the 2 tablespoons we had left in a bottle of Devil’s Spit. FishBoy19 really likes spicy BBQ sauce, so every once in awhile I buy him a bottle of that so as not to burn the rest of us. It’s super spicy stuff, but it was perfection on this pizza, adding just the right amount of heat, balanced by the pineapple. Yum! Feel free to use your favorite BBQ sauce. Keep in mind you may need more than the minimum 2 tablespoons. Devil’s Spit is a very thin sauce, so it spread very easily. A thicker sauce might not spread so well. Stock up on ingredients when they are on sale. Whether it’s chicken, pineapple, shredded cheese, bacon, BBQ sauce, or onions, I stock up when things are on sale. Shop Costco. Costco has the best price on shredded mozzarella. I buy the big five pound bag and divide it into smaller bags to store in the freezer. Preheat the oven to 475 degrees. Spray a 12-inch pizza pan or screen with nonstick cooking spray. Fit the pizza dough into the pan, stretching to fit. Spread enough BBQ sauce across the dough to cover. 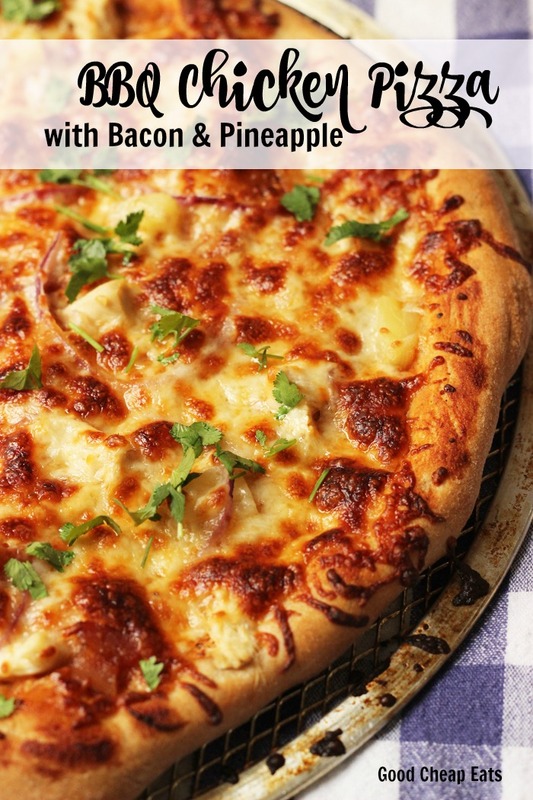 Sprinkle the chicken, bacon, pineapple, and sliced onion in layers over the pizza’s surface. Sprinkle the cheese over the top. Bake the pizza for 8 to 9 minutes or until the cheese is bubbly and the crust is crisp. Sprinkle with fresh cilantro. Remove to a cutting surface to slice. Love Pineapple on pizza! Either with chicken and bacon or just with ham. Husband LOVES Devils Spit! I hope you love the pizza as much as we do! Decided to make this tonight and just got home with the ingredients. Looking over the directions I now see chopped tomato… Will report back with finished product but just an FYI tomato is not in the ingredients list! Ignore the chopped tomato. I must have copied the directions from another post to save time and missed that. Sorry!